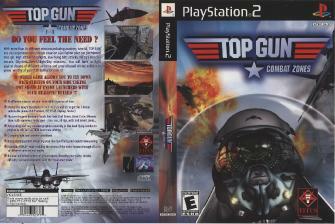 Rate This Thread - Top Gun: Combat Zones [SLUS-20211]. Вы начинаете игру в качестве кадета эксклюзивной академии Top Gun, которую вы должны закончить, чтобы стать легендой воздушных боев. Вас ждут более 36 миссий, вы пролетите через 3 эры прошлого и будущего, попадете в самое пекло известных театров боевых действий, но ваша цель одна - уничтожить вражеские боевые единицы. Простая и понятная система управления позволит всем игрокам стать потенциальными асами, хотя система оценок (звездочками) поставит все на свои места. Качественная реалистичная графика и геймплей делают "Top Gun Combat Zones" незабываемым! Who hasn't dreamed of being Maverick, the main character from the cult 80's movie TOP GUN ? Who hasn't fantasized, while watching this movie, about experiencing the ultimate speed rush, the action-packed "g-force in your face" DOGS FIGHTS ? 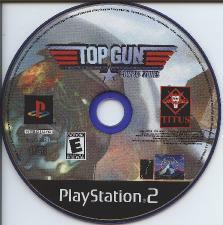 If this movie made your day, then get down on your knees and cry because your chance to live your fantasy has come : the TOP GUN academy is opening its doors to all PlayStation®2 computer entertainment system players !! A hip, heart-pounding combination of action, music and incredible aerial photography helped make Top Gun the blockbuster movie hit of 1986. Top Gun takes a look at the danger and excitement that awaits every pilot at the Navy's prestigious fighter weapons school. With more than 36 different missions, including flight academy, Top Gun: Combat Zones lets you experience every single situation a jet fighter pilot can face. High-altitude dog fights, low-flying blitz attacks, military and civil rescues, missions in a variety of terrains... you will have to fight against dozens of airborne and ground-based enemies to prove yourself worthy of the Top Gun rank! Top Gun: Firestorm is an F-14 in your pocket! Are you worthy to be an elite Top Gun pilot? Prove it while triumphing over all the missions and exceeding Iceman. Then face your friends in air duels without mercy! 2-player mode via Link Cable. Publisher : TITUS SOFTWARE CO.